Knitting Practice | Barbie Who? Just as I did with crochet before, I needed to do a test garment to help sort out my knitting skills. I am very happy that I took the time to do this because knitting for dolls in crochet thread is tedious and vastly different than knitting with worsted weight yarn. 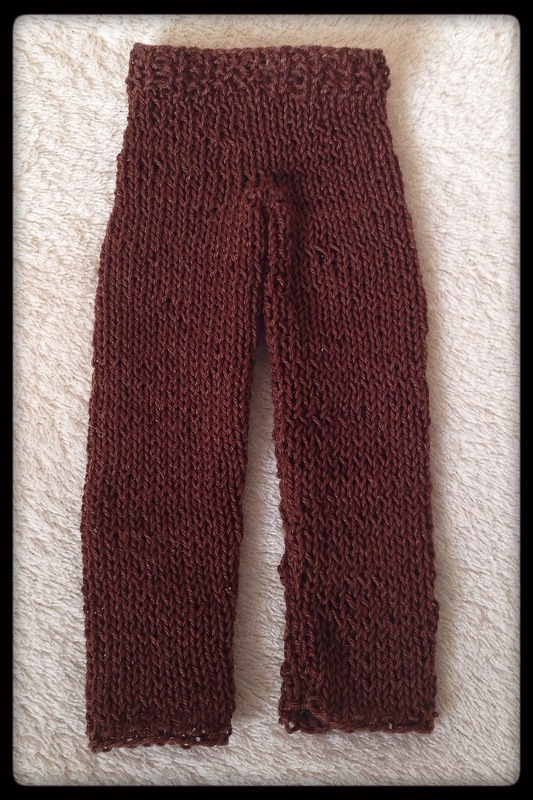 I did knit my own Doctor Who Scarf (I worked on it off and on for years – I will post a picture and talk about it when I post about the Dalek dress), and it was much easier to work with than these pants. As with crochet, the smaller scale ramps up the skill level needed to be successful. I started off by finding a pattern. I am using a pattern from Sticka till Barbie because I will be using two more of their patterns for Peri’s outfit. Their style of pattern deals with knitting a specific length instead of a specific number of rows, and I wanted to get used to this type of pattern. Basically, I’m killing two birds with one stone. I chose a pattern for a pair of pants to fit a Ken doll (pattern number 602). The pattern seemed straightforward; it didn’t include any fancy stitches or terms I am not familiar with. It seemed like a good primer in knitting for small dolls, so I went into it with gusto. Oh, how optimistic of me…. I started out with brown crochet thread I purchased at a thrift store ages ago. It had a little project attached to it; if I had I venture a guess, it was an owl eye. They had doubled up on the yarn to give it more bulk, so untangling it was a challenge. I took what I could work with and threw the rest in the bin. It feels like size 10 crochet thread in cotton. I picked out a pair of knitting needles from the lot I had purchased at the newer thrift store the last time I went shopping and began knitting. I chose the needles that said 2 because the pattern called for 2 mm needles. I did a long-tail cast on, and it didn’t turn out so great. The yarn kept tangling and somehow I kept getting extra loops on the needle. I did it again. Then a third time. Finally, after a fourth cast on, I had something I could work with. Unfortunately, the cast on wasn’t the only problem I had with this first attempt. The first row was too loose and filled with holes. I did a few more rows before I scrapped it entirely for being too loose. These two pictures really don’t do justice to the hot mess that this first attempt was before I unraveled it. Sheesh! Things just didn’t look at all like the pictures on the Sticka till Barbie website. 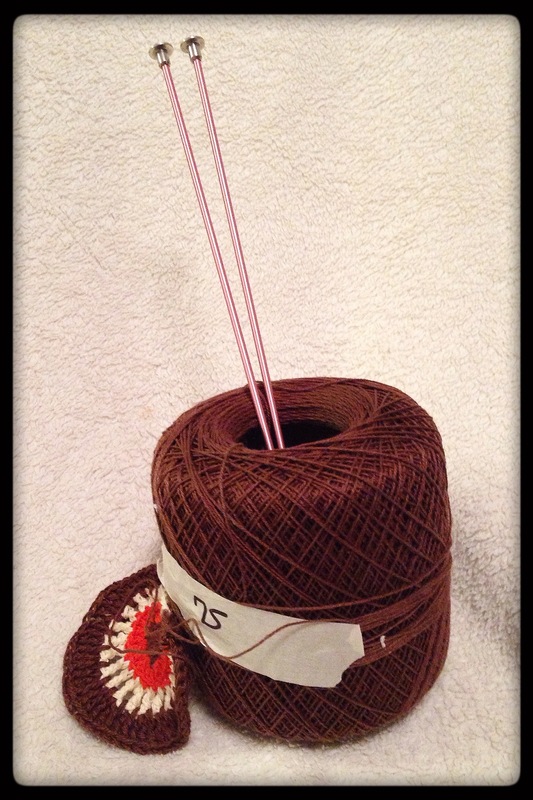 Then I realized… the 2 on my knitting needles probably didn’t mean 2 mm. They probably meant US 2 and US 2 were probably a different size. I got out a measuring gauge, and sure enough they were size US 2, which is equivalent to 2-3/4 mm needles. They were 3/4 mm too big, and I felt like a total dolt for not double checking the size on my gauge before starting. Not one to give up easily, I switched to the pair of US 1 (2-1/4 mm) needles I bought last week because they are the smallest pair of needles I currently own. I really hoped that the 1/2 mm smaller needles would work for the patterns. Thanks to my practice earlier, the cast on went much smoother; I managed to get it on the first try. The first row also was much tighter and looked like previous pieces I’ve knit in sport weight yarn. It was a much nicer look overall for the yarn I was using. The smaller needles worked! Yay! The technical problem with my first try were solved, but it was weird working with the smaller needles because they’re made from fairly bendable plastic. It was very hard on my wrists after a dozen or so rows. I had to take many breaks while creating this piece. This turned out to be a good thing because of my next big mistake. 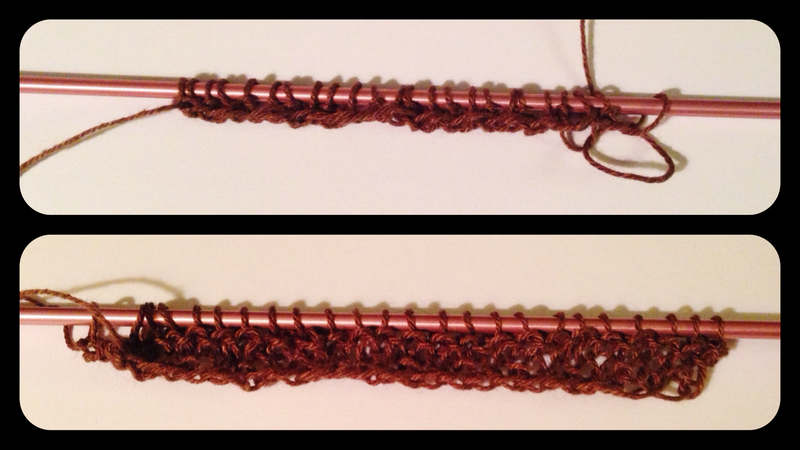 You see, I forgot the difference between garter stitch (knit each row) and stockinette stitch (knit a row, pearl a row). I worked the fist 4.5 cm of the first leg in garter stitch when the pattern called for stockinette. If I had stuck it out and done more, I probably would have finished the first leg before discovering my mistake. Luckily that wasn’t the case. I unraveled it, cast back on, and started knitting the first leg for a third time. This time I was able to do the pattern as written with only minor complications. At one point, I dropped a stitch and had to weave it back into three rows of the fabric, and twice I knit an entire row when I should have pearled that row. Luckily the piece held together well, so I was able to pick the stitches back up after unraveling the incorrect stitches. Neither is something I haven’t done before, but correcting it on the tiny doll scale was a challenge. It also made a few of the rows on the finished piece look a bit warped. These problems embody every single reason why I do practice pieces. 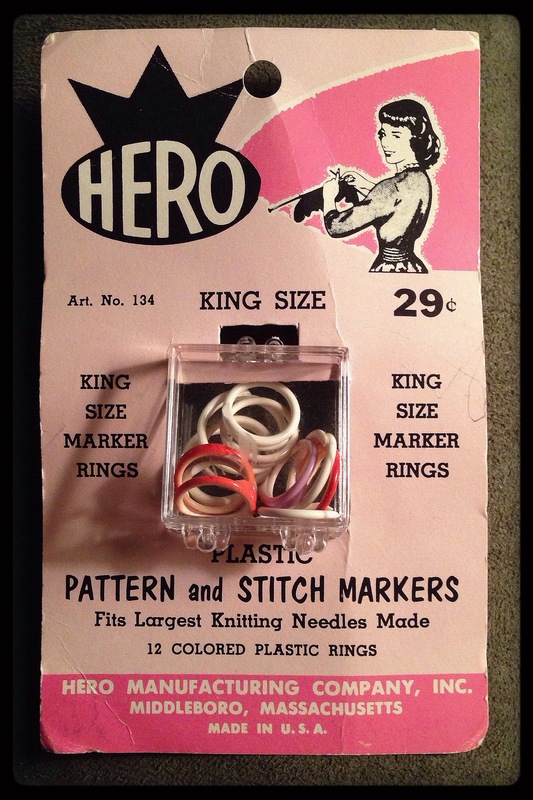 To help with the pattern, I used some cool old marking rings to mark stitches. I did this so that I could make notes about the number of rows on each pant leg. (if nothing else, I wanted the legs to be even). 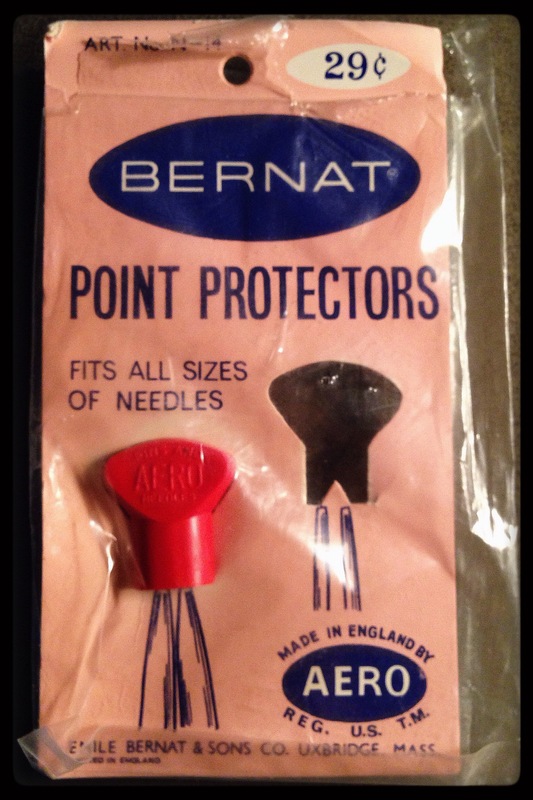 I also used a point protector – both were in a grab bag I bought at a thrift store. I love the design on their boxes! I just had to share these awesome finds. I love retro/vintage packaging. Some of the new stuff from Yarnology and Stitchology have some neat designs that remind me of these, but it just isn’t the same. As for the pattern itself, I had some minor problems understanding it at times. I like patterns that hold my hand and spell everything out. These patterns do not do that, so I had to interpret them and adjust them as I saw fit. I think some of this has to do with the fact it was translated from Swedish to English. This isn’t the biggest problem in the world, but it did cause me to have to pull out a few rows at one point because I misunderstood what the pattern needed me to do. One big advantage to this type of pattern is how easy it is to adapt to different sized materials and dolls. It is an amazing website, but make sure that you know your terms or have YouTube pulled up to show you how to do things before you assume you know how to do something. All of that aside, here are the results of my first knit piece. I finished it by sewing up the entire sides. The ribbing at the top of the pants gave them enough stretch that I didn’t need to sew on a snap or button. The hardest part was figuring out how to sew up the crotch; it took a few tries, but I did get it to fit properly. It was really awkward to work with the small size of them, but that is par for the course anytime you create something for dolls this size. It took me about 8 hours to create this from start to finish, but about half of that was due to my own mistakes. A more competent knitter could probably knock these out in an hour or two. The pants work very well for Ken, but they don’t come anywhere close to fitting Arachnid Guy. His large, muscular legs are just too big for these pants. I am happy that Ken now has something to wear besides the G.I. Joe vest thing he came with. Which reminds me, this Ken is a Fashionista Cutie Ken. I am not sure what year he was or exactly which box/set he came with. He has unarticulated arms, and every search I have done only comes up with the regular articulated dolls. I did find another blog that had one with unarticulated arms, but she didn’t say anything about that specific doll besides the fact he was a Fashionista Cutie Ken doll with unarticulated arms. I am guessing it was an earlier version, or perhaps a cheaper version of the doll that they rolled out at some point. I recommend these patterns to anybody who is a patient knitter. As inept as I am at times, I managed to make a nice pair of pants. This means you can do it, too! I have a great amount of respect for the person who made these patterns because the sheer number of them is mind boggling and they all look amazing. Hopefully I will make more as time goes on. Well, I know I will make at least two more in the near future…. I learned so much from this. Just like the few outfits I crocheted, knitting with tiny needles and tiny thread is fairly different than with larger fare. Now that I am more familiar with the techniques needed, I can make items at the quality needed for Barbie Who? I will begin on Peri’s outfit and post an update as soon as I have something to show for it. Nice job on the pants. They look good on Ken. I have crocheted Barbie clothes before, but I dislike using the thread. My wrist hurts too much when I use the smaller hooks. I know! It was terrible. With crochet, I can use a handle to help with the wrist pain, but there is no helping when you knit. It got a little better as I went along, but I know I can’t knit with this stuff every day. Maybe every two or three days so my wrists can recover. We could always just stop completely…hahahahahahahahahahahaha! They turned out well in the end. That site is pretty amazing. I think that more than one person may have contributed patterns because I ‘ve noticed variations in the descriptions of yarn types and other minor things. I have not found any yet that tell you how to make up the finished pieces. I’ve had to guess with the ones I’ve done but they are very straightforward really and most are designed to slip onto the doll and don’t need fastenings which is good. When I started using the fine yarns and needles my wrists got very sore too but now i am used to knitting again and it’s not too bad. I can knit for 3-4 hours without discomfort although I don’t do it every day. My sister has a couple of Ken’s similar to this one and they came dressed in tuxedo’s. One in black and one with a white jacket I think. I think one was a groom. One had straight arms, one the slightly bent arms and just quickly looking at my photos of some of them I think one did have articulated arms but I can’t recall their correct titles. They were cheap ones and Mattel did two or three who are quite similar looking to each other as they tend to do with Ken. Do one look to death before they change it. That is fascinatig about the fashionista Ken dolls. It gives me a lead for identifying him. Thank you! Once again, your knowledge is amazing. 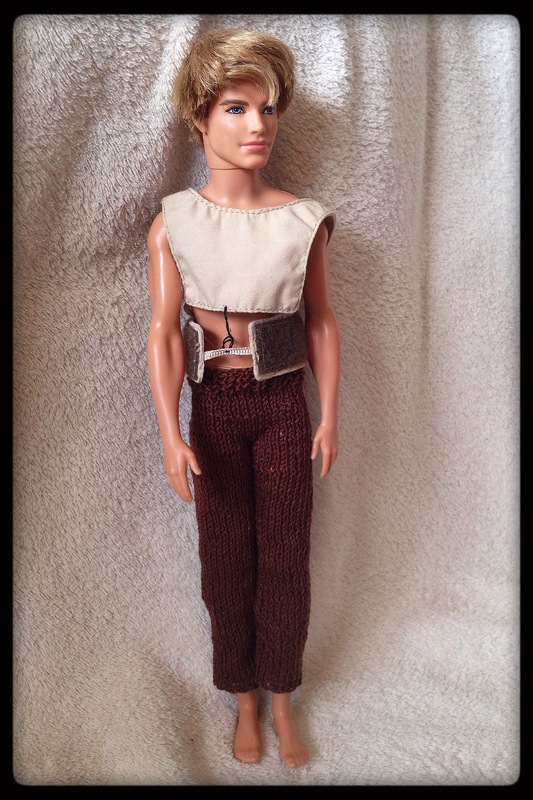 Pingback: Ood Pants, Take 1 | Barbie Who?